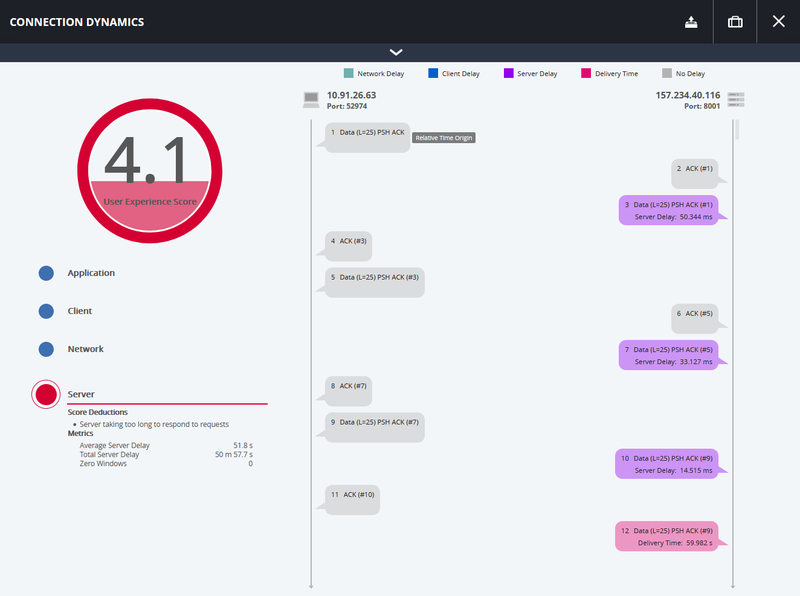 Observer Apex provides a unified point for network performance management through comprehensive end-user experience visibility. It also strengthens security defenses through active identification of unexpected performance and user behavior and providing in-depth post-event security forensics. Apex serves as the centralized starting point for troubleshooting service anomalies, managing network resources, and aiding investigations of incidents of concern (IOC) or confirmed security breaches. From here, IT teams can quickly gain access to relevant network, infrastructure, and user operational metrics. Apex delivers an out-of-box experience like no other network performance monitoring and diagnostics (NPMD) solution on the market. You get the information needed to maintain comprehensive IT service awareness and rapid troubleshooting. Learn more about Network Performance and Enterprise Performance Management. Apex provides End User Experience Scores on every network transaction, individually and logically grouped across multi-dimensional variables at the dashboard level. Integrated with out-of-the-box workflows and site-based views, End User Experience Scores empower engineers to identify the largest issues from the user perspective and navigate a guided path to resolution. Color-coded, numeric values between 0 (worst experience) and 10 (best experience) coupled with the identified problem domain and simple problem explanation along with performance visualizations provide fast resolution without need of specialized troubleshooting skills. Geolocation intelligence provides awareness of IT service health whether at the regional, country, city, or data center levels, with even more granularity to individual service groups such as accounting. Users can easily define these parameters to the individual subnet and VLAN to gain intelligence within or between these defined breakouts. Site-based workflows synchronized with end-user experience scores enable users to quickly assess the impact of performance issues on the network and efficiently navigate to the problem domain whether tied to application, network, unified communication, or security. On-demand application dependency mapping offers fast discovery of app interdependencies. Maps are built automatically to display complex relationships with simple clarity. This allows users to determine worst connections, app tiers, and network delay threshold deviations, while sorting all connections by status; critical, marginal, and acceptable. Leveraging the rich data sources from GigaStor wire data and GigaFlow enriched flow records, Apex is an outstanding solution for aiding existing security solutions to limit IT threat vulnerabilities via a combination of forensics, threat identification, and traffic profiling. Apex now includes simple workflows directly to GigaFlow. 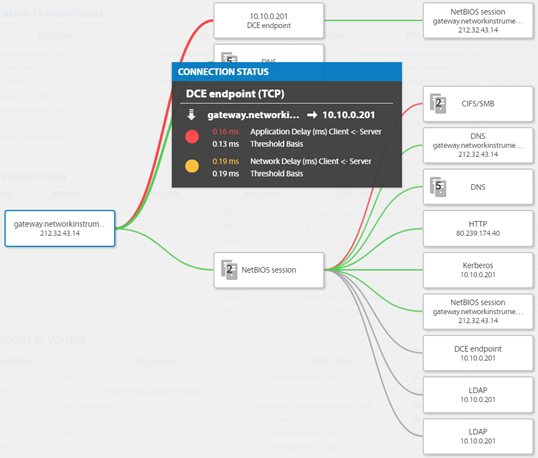 Begin at the Welcome screen then search by MAC address, IP address, or subnet to gain insight into the health of the network infrastructure and traffic behavior using the wealth of data captured in enriched flow records. Leveraging the rich data sources from GigaStor wire data and GigaFlow enriched flow records, Apex is an outstanding solution for aiding existing security solutions to further limit IT threat vulnerabilities via a combination of forensics, threat identification, and traffic profiling. Apex collects and aggregates data from GigaStor and GigaFlow to achieve enterprise-wide performance and security visibility for NetOps and SecOps teams. By intelligently combining GigaStor network conversation information and enriched flow records from GigaFlow, Apex delivers centralized management of end-user experience, performance, and security intelligence. As the centralizing reporting point for Observer, Apex provides flexible, customizable real-time dashboards and long-term historical reporting from aggregated wire data collected in GigaStor and GigaFlow. Beginning at a dashboard, users can review IT health and as required troubleshoot problems. Observer Apex can be deployed as a standalone hardware appliance or software version. 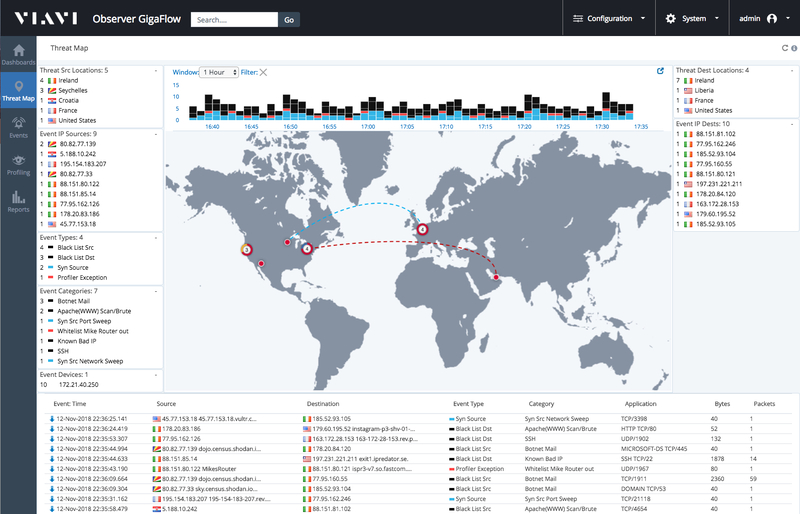 As the centralized reporting and troubleshooting launch point of Observer, Apex makes accessing GigaFlow enriched flow records or GigaStor traffic capture simple. Please refer to the following link for technical details. If you are installing Apex on your own hardware or a virtual machine, please see the following link for minimum, recommended, and optimal system requirements. Video Series: 5 Common User Complaints. Fix Them Fast.